I think I especially miss them now in the wake of USA Election 2016 & Inauguration 2017. Peace between these two men was not plastic or forced… but forged. A plowing through respecting differences while seeking to cultivate their common ground. from they way they took their coffee to the intensity of emotional expression. or came to a compromise. in my life – both lived into their 90s. 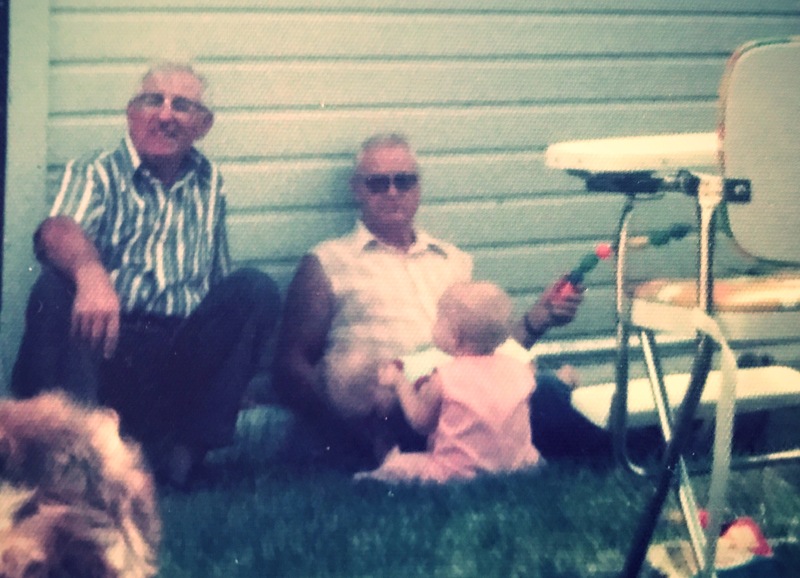 always consisted of roast, potatoes, carrots and conversation about the sermon and subsequent application. From macro-scale conflicts, like economies, public policy, & current events to the more micro-scales of community, church, & home… all up for discussion around my grandparents dining table. But summer Sunday’s, in particular, could get interesting as my great-grandpa, a retired preacher & the Italian, offered spice to those conversations … without even trying, really. My Grandpa, The farmer & the Swede, welcomed & honored, his in-laws summering on the farm. His own parents were second generation to farm this isolated land on the Wyoming-Nebraska border. This small community comprised of the offspring of enticed Swedish immigrants who preferred the quiet spaces & intense labor of land to the noisy opportunities of cities. … although they indeed made room for it… hence why they ventured north for the summers. They spent a lot of time gathering groups to go fishing, but even with a boat full of people, we all knew when the lures cast out… we waited & reeled in quietly. My great-grandparents enjoyed encouraging the young “whipper-snapper” pastors. Patiently encouraging… persistently praying… Always choosing to reinforce the bright & beautiful… although quite aware of the gossip & grime of any congregation. And honestly, for their time, they viewed church a bit avant garde. They attended three churches during their time in St. Petersburg, FL. When I say three, I don’t mean one one year & another the next. I mean, they attended three different churches. I spent a month with them at one point, so I experience it first hand. My Italian Grandpa explained how much he loved the music at one church, so they went there for that. The teaching was weak there, so they’d attend another service for sound sermons. And finally, the fellowship of another… the people – personable, welcoming- real fellowship despite weak leadership & stale sounds. The Italian was not being hyper-critical of any of them. He just viewed his role as retired pastor as one to encourage the young’uns & continue to engage with people. He loved fishing & wrote weekly sermons into his late 80s. My Grandpa -the Swedish farmer- had traveled the world as a pilot in the United States Air Corps during World War II. As an enlisted man turned officer, the United States military in wartime honed him into manhood… the old fashioned way… He earned it. Quiet strength, yes. But, he was nearly released from military due to multiple less-than acceptable physicals. He’d altered his diet, but it just made things worse. Finally, he returned to his eggs & bacon breakfast… and passed every physical after with flying colors. He served as a pilot primarily over Indo-China. He flew The Hump – aka the Himalayas. He’d seen the world, but he loved serving his family & neighbor… wherever he found himself. Their personal histories -important & unique- could have kept them distant… could have kept them suspecting, confronting, complaining, gossiping… but, both these men embraced opportunities to share the Hope they had. Hope the transcends the past… lives in the present… envisions brighter future… & shares Joy in diversity, Love beyond commonality & forging lasting kinship based on mutual respect. I sometimes wonder if our over-exposure to technology … a flat screen observatory that lacks sighs & pulses… contributes to highly under-developed relationships. Could it be … comparing, critiquing, complaining big ideas while yielding less & less to counterpoints… thus, reducing opportunities for real compromise simply because we mistake seeing stock photos with sharing soul moments – eye to eye? The less complaining & the more communicating we do weeds out disrespect & resistance while also emboldening honorable humility & reviving a reciporating respect. They could not have been more different in many ways – from they way they took their coffee to the intensity of emotional expression. Wow Heidi! Very good. Thanks for doing this. You captured the subjects brilliantly. Thank you, Uncle B! Grateful you agree. Grateful for them as I know you are, too. And they’re recognizable… bc the weight & wonder of memories.